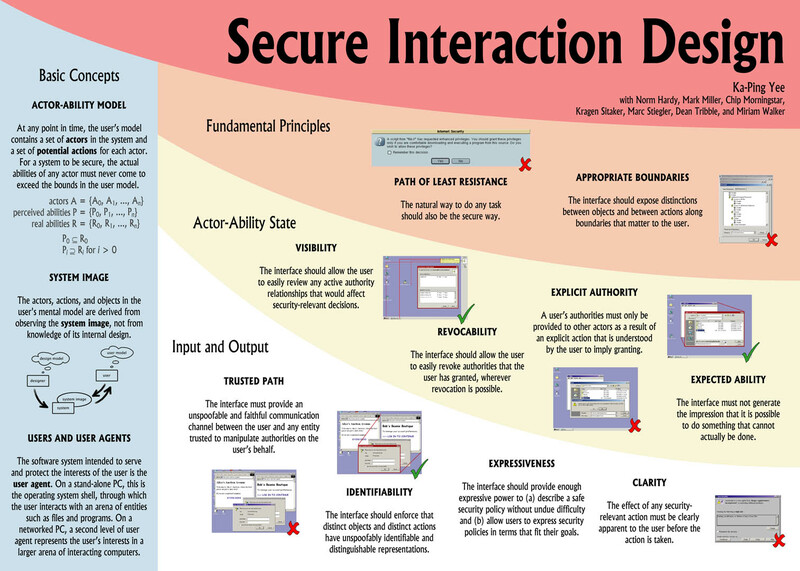 This is an ever-green link-dump post of great resources we come across for bridging the gap between usability, security, and at-risk users. Usability 101: Introduction to Usability Jakob Nielsen’s introduction, and his classic 10 Usability Heuristics for User Interface Design are important starting points, and carefully and honestly walking through both with a tool will help expose and solve many problems before engaging in more costly work. Open Source Design Open Source Design is a growing collection of resources for designers working with open source projects. True to its form, it’s run out of an open github repository. Their @opensrcdesign twitter account is also worth following. Notification Overload and User Control Not specifically talking about security, but managing priorities and notifications for users is even more critical for privacy-managing applications. Web Accessibility and Testing This is a brief overview of web accessibility resources for testing created by Nancy Reyes of HearColors. How Designing For Disabled People Is Giving Google An Edge This is a great post on how Google products are becoming more usable for all users due to accessibility improvements, from improved machine learning and notifications to simply being able to read a screen in full sun because it is following good accessibility guidelines for contrast. A story about Jessica. You may follow @SwiftOnSecurity for the flippant information-security jokes and relentless trolling of Linux users, but “A Story About Jessica” is a pretty damning indictment of the current state of computer security for actual people, and the actual barriers they face. Understanding Internet Freedom SecondMuses’ “Understanding Internet Freedom” series contains really in-depth studies of specific at-risk communities and the challenges they face with digital security.